When a friend told me about the Caffeine tracker app for my iPhone, I spent some time looking around and found a fun Coffee Art app. A glance around the internet finds many food sites that show how creative people can be with their coffee art. There are books and YouTube videos on how to do those fun bits of art too. All of which are great when sitting on the couch, but when in the kitchen or on the go, you need an app for that. I found one! 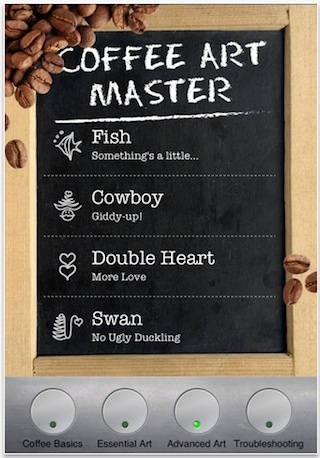 The iPhone app is called Art of Coffee. And, as the name implies, the application shows you step by step how to create an extra dimension to your morning express0. If not for you, it’s a nice thing to do for someone else you might be pulling a shot for. The Art of Coffee is only about creating a visually pleasing presentation and not about the actual action of pulling a shot. 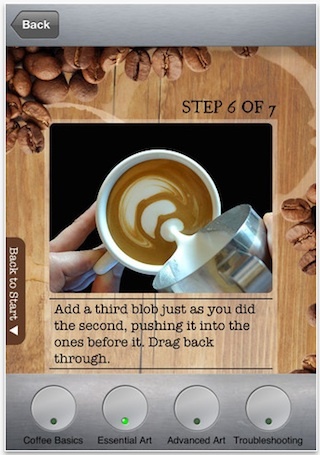 That said, there is coffee and milk tips in the app, but the 30+ pour instructions are the reason to take a look. Use Art of Coffee for a few tips then choose a design and learn step by step how to make bits that jump out of the cup. Advanced Art: Butterfly, Ghost, Rabbit, Monkey, Pig, Dragon, Seahorse, Fish, Cowboy, Double Heart, Heart within a Heart, Swan, 6 Leaf Tulip, Double Rosetta, Phoenix, Rosetta with Double Heart, Wreathed Heart, Rosetta with Tulip, Double Heart Double Rosetta.